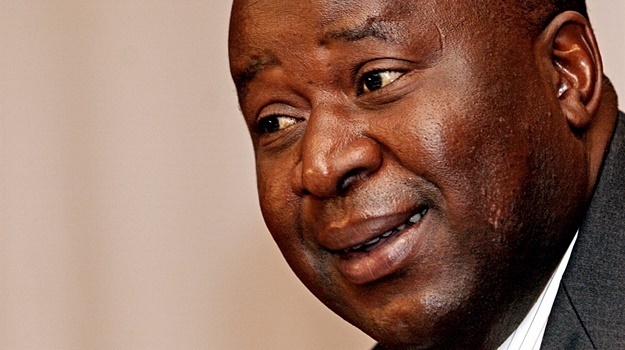 Financials held on to their gains despite the rand's slump on worries over the health of the SA economy following Finance Minister Tito Mboweni's mini budget. The JSE has tried to stage a rebound in the afternoon session but it came up short to close weaker. Concerns over the health of the SA economy following Finance Minister Tito Mboweni's mini budget speech have seen the rand tumble sharply against the US dollar, said Lukman Otunuga, Research Analyst at FXTM. He said probably one of the largest takeaways for financial markets from this statement is that economic growth projections for 2018 was cut to 0.7% compared to the 1.5% announced in February this year. "It does also need to be highlighted that this statement did rightfully indicate that the uncertain external environment and international market volatility is weighing on economic prospects. " Despite the gloomy outlook for 2018, Otunuga said there is still some light at the end of the tunnel. "Growth is projected to recover gradually to 2.3% by 2021 amid improving business and consumer confidence. The rand weakened almost 2% to levels last seen at the time of Tito Mboweni's appointment as new finance minister two weeks ago. By 16:23 the local unit was trading 1.86% weaker against the US dollar at R14.52 after Mboweni failed to appease markets. His first mid-term budget after taking up the hot seat two weeks ago, showed South Africa's debt burden is heavier than previously thought. According to the medium term budget policy statement (MTBPS), government's gross loan debt is expected to accelerate to 58.5% of gross domestic product (GDP) in 2021/22, up from 55.8% - an increase largely attributed to currency fluctuation. Speaking to journalists before delivering the budget policy statement, Finance Minister Tito Mboweni said the acceptable debt-to-GDP ratio would be a figure below 50%. The rate stood at 52.7% of GDP in 2017/18. 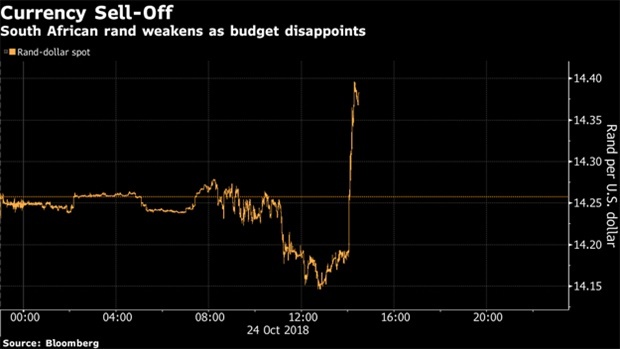 The rand weakened and bonds reversed gains after Finance Minister Tito Mboweni said government debt will peak two years later, and higher, than previously forecast, the fiscal gap will widen further and state revenue will continue to undershoot. The rand declined 0.73% to 14.36 per dollar by 15:21 in Johannesburg, reversing a gain of as much as 0.8%. Yields on benchmark 2026 government bonds climbed three basis points to 9.18%, erasing an earlier drop of 10 basis points. “The market seems to be disappointed with much higher than previously envisaged budget deficits in coming years, which is a timely reminder of the fiscal challenges South Africa faces as a result of weak economic activity,” said Piotr Matys, a London-based emerging-market currency strategist at Rabobank. The market does not like Tito Mboweni's medium-term budget policy statement. "The new finance minister has got his work cut out for him," comments TreasuryONE. South Africa sees 2018/19 budget deficit increase to 4% of GDP from 3.6% in Feb budget. The deficit will also grow to 4.2% in 2019/20 and remain there for 2020/21. This is all higher than announced in the Feb budget. The tax revenue short fall will be R27.4bn for 2018/19. Treasury will help SOEs as follow: SAA to receive R5bn to settle debt redeeming between now and March 2019. SA Post Office receives R2.9bn to reduce debt levels. SANRAL receives R5.8bn to compensate for non-payment of e-tolls, of which R3bn is an additional allocation. USDZAR still on the backfoot. President Cyril Ramaphosa’s ambitious plan to kick-start the economy, fix state-owned companies, attract billions in investments, and restore policy certainty - all at the same time – has taken centre stage in the mini budget tabled by new Finance Minister Tito Mboweni. The rand has been on the back foot after the start of Tito Mboweni's MTBPS. The local unit has given up all of its overnight gains to now trade at R14.39 to the US dollar. The rand weakened to R14.30 to the US dollar as Tito Mboweni starts delivering his maiden mini budget speech. USDZAR has been on the back foot after the start of the Medium Term Budget Speech. USDZAR currently at R14.36 from R14.16 earlier, says TreasuryONE in a snap note. The rand is trading at its best levels in just over 3 weeks against the US dollar as all eyes turn to Finance Minister Tito Mboweni who will deliver his maiden mini budget in less than 30 minutes. TreasuryONE's dealers expect the rand to test R14 to the greenback should Mboweni succeed in assuring the markets that South Africa is on the road to recovery. By 13:33 the local unit was trading 0.58% firmer at R14,17 after testing R14.14 earlier in the session. While we're waiting for Minister Tito Mboweni's maiden Medium-term Budget Policy Statement, here's the mini budget explained for novices. US equity futures extended losses and Asian shares declined on Wednesday as investors nervousness lingered after the latest bout of market volatility. European stocks bucked the retreat, and the dollar advanced with Treasuries, reports Bloomberg. Contracts on the S&P 500 pointed to a sixth day of losses for the main US gauge, with those on both the Dow and Nasdaq also in the red. A turnaround in China’s markets helped keep the MSCI Asia Pacific Index from slipping into a bear market, though the benchmark edged lower. Retailers were the biggest winners in the Stoxx Europe 600 Index, while Barclays Plc climbed on earnings and Deutsche Bank fell after cutting its revenue outlook. The pound weakened on Brexit worries, and European bonds followed Treasuries higher. The euro dropped following disappointing manufacturing data. 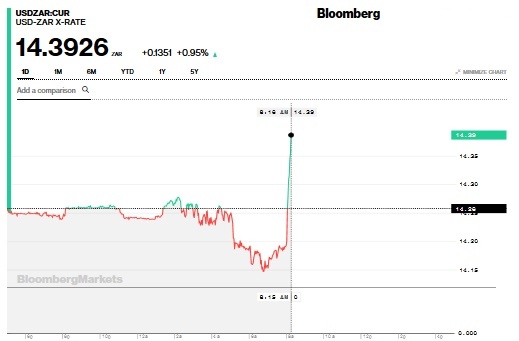 The local unit just dipped under R14.20 to the US dollar, currently trading 0.43% firmer at R14.19 ahead of Finance Minister Tito Mboweni's mini budget speech. The rand traded at R16.22 and R18.37 against the euro and pound respectively. While trading in relatively tight ranges for the past couple of days, today is the day local markets have been waiting for. "Judging by the rand's performance overnight the market expects a speech that will take the road less travelled and start the road to recovery by signalling better fiscal management in the future," said TreasuryONE dealer Andre Botha. He, however, cautioned that the rand strengthening to levels closer to R14.20/$ could be a situation "of the cart leading the horse and we could have a knee-jerk weaker should the market not be pleased". TreasuryONE expects firstly to get some greater clarity on the proposed stimulus package from Finance Minister Tito Mboweni's mini budget speech at 14:00. Secondly, Botha said, it will give Mboweni, even though only two weeks in the hot seat, a chance to show his hand in how he will return confidence to the public in the workings of government and not put further strain on an already overextended tax base. The speech would also need to show the way forward for state-owned enterprises, appease rating agencies, and lay the foundations for next year's National Budget Speech and better fiscal management, said Botha. He expects the rand to trade in the current range - R14.23 - 14.27/$ - up until the speech and to react quickly thereafter. Botha sees a slight bias to the rand testing R14.00 again, but there is enough uncertainty that a knee-jerk higher cannot be ruled out. 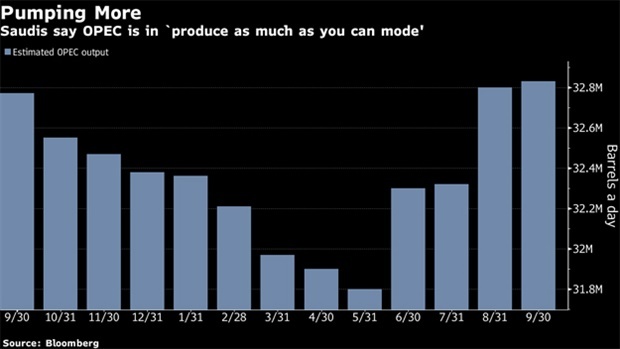 Palladium, a precious metal widely used in the automotive industry, has hit an all-time high on concern over shortages and speculators piling in to bet on even higher prices. The majority of palladium is used to make catalytic converters in gasoline automobiles, and there’s increased demand for the metal as consumers increasingly choose gasoline vehicles over diesel. In a year that’s seen losses for most other commodities, the rally in palladium has been exceptional. Here’s what you need to know about the rally. 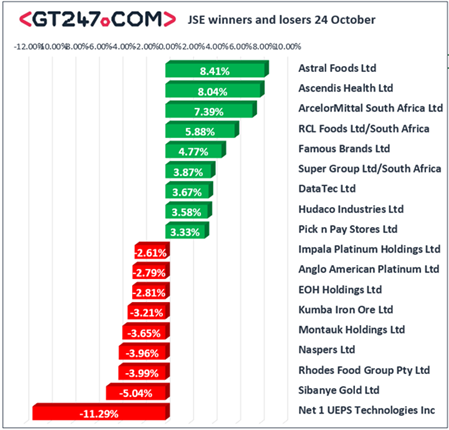 The JSE extended its losses on Wednesday, tracking US losses and as gold counter investors took profit. By 10:30, the JSE All-share index gave up 0.81% to 50 755 points, dragged down by a 2.59% slump in the Gold Mining Index. The Top-40 index slid 0.87% to 44 616 points. Oil counters also suffered, with Montauk (-3.53% to R82) among the biggest losers. Sasol also dropped 0.19% to R483.07. 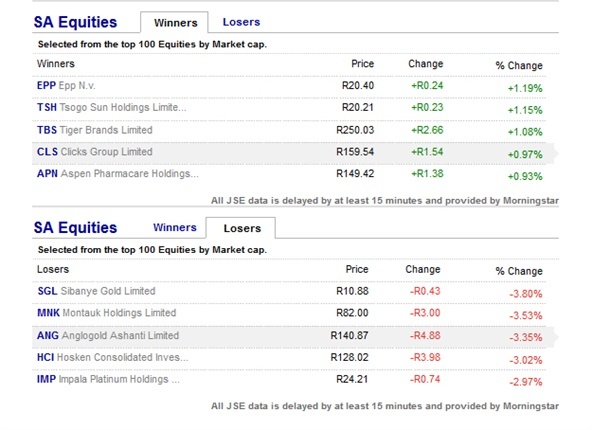 On Tuesday the blue-chip JSE Top-40 index closed 2.23% weaker, while the JSE All-Share index dropped 1.98%. The headline CPI (for all urban areas) annual inflation rate in September 2018 was 4.9%, unchanged from August 2018, official data showed on Wednesday. Statistics SA announced that on average, prices increased by 0.5% between August 2018 and September 2018. Last week SA Reserve Bank Deputy Governor Francois Groepe said South Africa’s monetary policy stance remains accommodative and interest rates will need to increase to keep inflation within the target band if the central bank’s current forecasts play out. The rand is currently trading 0.19% firmer at R14.23 against the dollar. European equities advanced after tumbling to a 22-month low as investors turned their attention to positive earnings’ surprises, reports Bloomberg. The Stoxx Europe 600 Index added 0.4% after sinking to a December 2016 low on Tuesday. LVMH climbed 3.2% after Kering’s Gucci beat estimates in the third quarter and rose 12%. Nordea Bank AB dropped 2.7% after third-quarter net missed estimates. Oil’s decline weighed on European oil majors, including Royal Dutch Shell and Total. European investors have been stuck between a rock and a hard place as earnings disappointments pile on top of the concerns about Italian budget negotiations. The region’s equities fell for five days straight through Tuesday, renewing worries that the bull market had been stifled by the rising US interest rates. Investors are grappling with what’s set to be the worst month in more than three years for global shares, reports Bloomberg. Stocks in the Asia-Pacific region are close to entering a bear market amid a rout in Chinese shares that have been prone to wild swings amid government attempts to temper the sell-off. Sentiment remained fragile after Caterpillar repeated a warning from earlier this year about rising costs due to higher steel prices and US tariffs. Italy was also in focus after Prime Minister Giuseppe Conte said his government had no “Plan B” for its budget. Today, NKC Africa Economics expects that SA’s consumer inflation rate ticked lower to 4.8% y-o-y in September from 4.9% y-o-y in August as the weaker currency and the recent spike in fuel prices put upward pressure on consumer prices. "Despite the SA economy slipping into a technical recession, revenue collections for 2018/19 FY have surprised to the upside so far. Total gross main budget tax revenues were 11.2% y-o-y on a year-to-date basis at the end of August versus a forecast increase of 10.6% y-o-y. 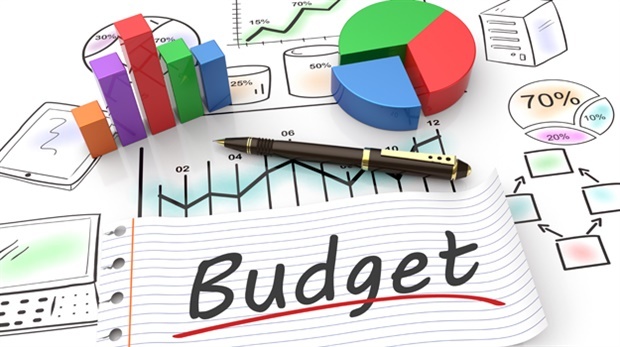 Granting, some tax receipts lag somewhat and the expenditure side is under pressure due to the wage bill being notably higher than budgeted for." Tomorrow, NKC expects SA’s producer inflation rate will decelerate to 6.0% y-o-y in September from 6.3% y-o-y in August. The rand is trading below the R14.30’s against the US dollar ahead of today’s MTBPS as all emerging markets are stronger this morning. The budget speech will be key for further ZAR strength and is expected to be a market mover locally. Across the pond US equities saw a massive sell-off yesterday after lower than expected earnings from major US corporates, this in return boosted the price of gold. The price of Brent crude fell below $80/barrel as Saudi Arabia pledge to increase production to as much as possible, calming concerns over a fall in supply after sanctions placed on Iran by the US. A broader ZARUSD range for the day is R14.00 - R14.50, but a possible break above R14.50/$ if the medium term budget disappoints. The rand started on a firm footing, strengthening two cents after opening at R14.25 to the US dollar as all the attention shifts to new Finance Minister Tito Mboweni's maiden Medium-term Budget Policy Statement. The minister is set to deliver his speech at 14:00. Brand reputation expert Solly Moeng told Fin24 in a studio interview that Mboweni's biggest task is to assure not only the markets and investors, but also ordinary South Africans and the taxpayers. Other local market moving data to be released today is the Consumer Price Index. On the global front, stock markets slumped on Tuesday on geopolitical risks stretching from US tensions with Russia and Saudi Arabia to trade issues with China, as well as Italy's budget stand-off with the European Union. In Asia, equities fell again on Wednesday extending the previous day's geopolitics-fuelled sell-off, with energy firms taking another battering in response to an oil market rout.